The Molton climbing frame from Selwood is a fun-packed playset with plenty of fun accessories to keep kids amused. The Molton features a wooden play fort with a raised play deck for children to climb to, a lower play cabin, a rockwall ladder, a slide, a picnic bar and a combined monkey bar swing module. The Molton climbing frame is designed to suit small to medium sized gardens but keep boredom at bay with a wide range of activities. The Molton is similar to other playsets from Selwood including the Hope climbing frame, the Milford, the Hartley, the Belton, the Branbury, the Croft, the Osborn and more. Although Selwood play frames are crafted with self-assembly in mind they can be time consuming to assemble from scratch plus tricky if you are not familiar with the fixtures and fittings. Our professional team of experienced climbing frame builders can take the stress of a DIY climbing frame away and ensure it is safely assembled in no time. The Molton climbing frame features a sturdy wooden play tower which is designed to stand on top of grass or a safety surface. 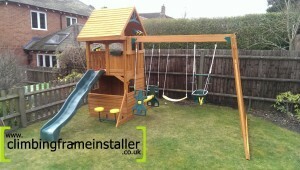 The play fort includes a spacious play deck for children to climb to which stands approximately 1.5m from the ground. The play deck has ample space for several kids to play together at once and is enclosed around the outside to keep little ones safe while playing in the tower. The play fort is covered by a wooden roof which helps keep the play deck sheltered from precipitation and shaded from direct sunlight in the summer. Kids can climb to the play deck using the rockwall ladder at the back of the play frame which provides two activities in the space of one. Children can test their coordination skills by using the hand and f oot grips only to climb to the play deck or the steps of the ladder can be used to make the climb easier for younger ones or less confident climbers. Beneath the play deck there is a second playhouse which is enclosed around the outside. The lower play cabin is a spacious area sheltered by the deck which makes it an ideal play den and a great place to store other outdoor toys too. The bottom play cabin features a window hatch at the front of the play tower which doubles up as a picnic bar with stools for kids to sit on. The picnic bar is a handy accessory as it can be used for games as well as a rest or snack time between play. The Molton climbing frame also features a wavy slide at the front of the play frame. The wavy slide makes a fun ride down from the play deck plus it has high moulded sides to help keep children safe the whole way down. The bump in the middle of the wavy slide makes for a slightly speedier ride but it is still a very popular climbing frame accessory. 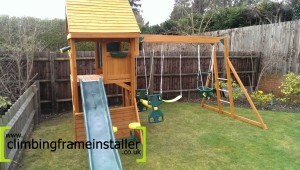 The Molton playset from Selwood also includes a combined monkey bar swing module. This is an extremely popular climbing fame accessory because it is a brilliant space saver and kid s don’t miss out on an activity if you have a smaller garden space. The combined monkey bar swing module provides two fun activities in the space of one. This features in many playsets in the Selwood collection. Monkey bars are a great way for kids to develop strength, balance and coordination skills, but is a fun way for little ones to climb to the play deck at the same time. Monkey bars can be challenging so are fantastic for keeping older children involved and will give younger ones something to grow into. 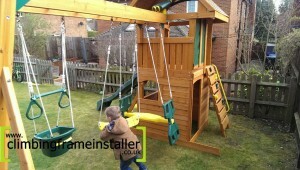 The swing set included with the Molton climbing frame features two single belt swings as well as a two seater glider swing. The Molton playset pictured here includes a baby swing which can be purchased separately for use with any play frame if you have younger children in the family. The glider swing is a nice way for children to play together and work as a pair to swing and the belt seats are good for younger ones as they flex around children’s hips to help keep them safely balanced on the swing. 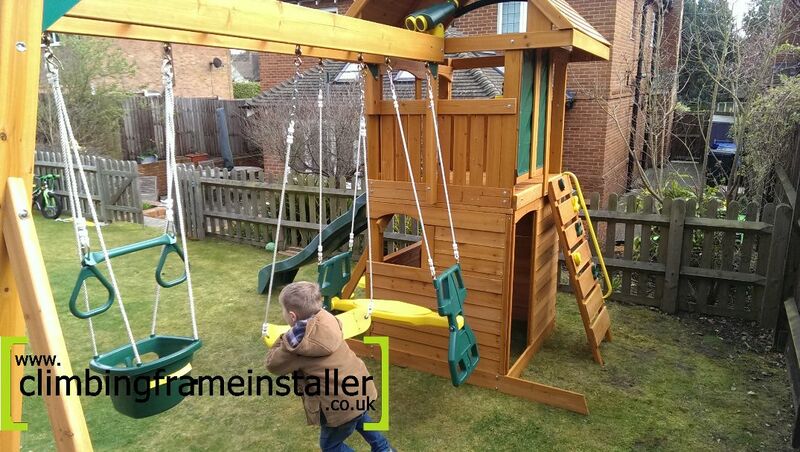 For help with installing your climbing frame contact the climbing frame installers today. 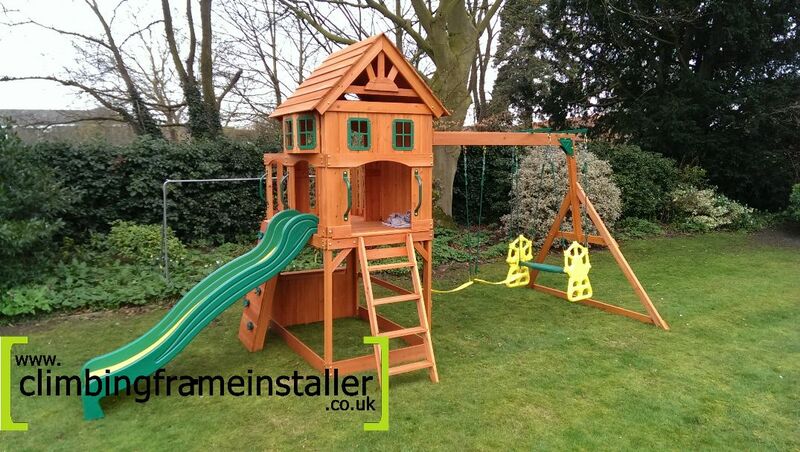 Our experienced team of climbing frame builders specialise in the safe construction of outdoor play frames and provide a professional yet affordable installation service. For a quote please call 07792309588 or email: [email protected].